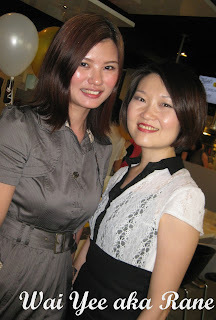 It's my honour to attend My Women Stuff Reader's Choice Awards 2011 Awards Party at Coffee Chemistry Cafe, Sunway Giza on last week end. The intention of the party is to announce the winners of the inaugural MWS Reader's Choice Awards 2011 which MWS have participated in. Most of the participants are bloggers and we met up happily in the party. Loads of food, nice cake and nice coffee were serve to the attendees on that day. I am Happy to meet my beloved beauty blogger ~ Paris B in person finally. Paris B looks very pretty and feminine. She has good skin that I admire and she is very friendly. Thanks sponsors for the generous goodie bag.